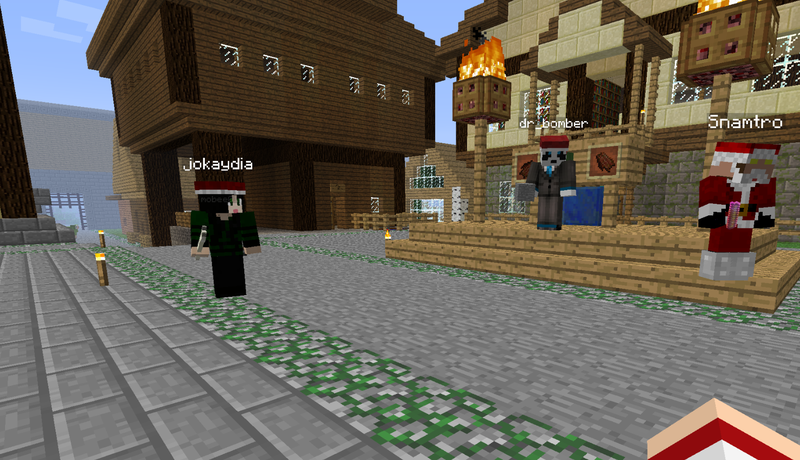 Jokaydia monitors children ages 4-16 in constructing spaces in Minecraft. Students use video capture and editing software to make machinima. This student built space is a historical complex. Ask a 10-year old how they know something or learned to do something and the answer may very well include “I saw it on YouTube”. With “Digital Literacy” and Coding being recognized as skills required for future success, and employment, it seems to make sense to update academic fairs to include digital elements beyond word processing. Perhaps instead of cardboard box dioramas, sugar-cube structures and tri-fold cardboard displays we could accomplish learning objectives with machinima, digital storytelling, websites, blogs, wikis and 3-D digital modeling. This is not to diminish the use of art supplies and creativity in the visual arts. Manual dexterity and artistic expression is important, but not the primary objective of Academic Fairs. 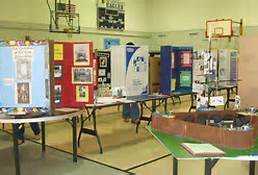 A Traditional Academic Fair Display begins in a school with winners being displayed regionally at a local Mall or Library. Many of us have participated in promoting, supporting , guiding or completing the work for a child participating in an academic fair. I still remember a 2:00 AM crying moment and my older brother helping me (actually he did the whole thing with exception of the windows that just were perfectly illustrated with a tap of a magic marker) to make a model of the Pentagon. To this day I know very little about the Pentagon (the empire state building would have been so much easier) but I did learn some geometry, some research skills, collaboration (sort of), time management (after the fact), and I am still a night owl. It is the process that is important. The artistic work and use of materials, though an obvious focus to fair attendees, is secondary to what the student learns. Whatever I learned through my 6th grade Social Studies Project experience, was not reflected in my brother’s ability to construct models. Machinima made by capturing video in an immersive environment or video game and edited with sound, music and dialog to depict a historical event, literary work, or scientific concept requires research, planning, and time management skills. Building a model in a 3-D environment like Minecraft requires planning, sometimes research, digital literacy, creativity and time management. Developing a website requires similar skills. Each of these digital possibilities requires the same basic skills that traditional academic fair projects require, in addition to digital literacy. Collaboration is not typically included as an objective in academic fairs, though parents and older siblings are sometimes involved. Including collaboration as an objective would align to Common Core Standards and 21st Century Skills and the collaboration would likely include peers. Parent involvement may actually be flipped in this model, with the student guiding the parent to understand the digital environment, particularly as it applies to immersive or game environments. Time and space become less of a barrier as a local fair can potentially expand to a global fair with public views and even community “up votes” on deserving entries. Collaboration with peers from different geographic locations could potentially help prepare today’s students to collaborate globally as adults. It seems logical to take advantage of the use of digital spaces by our youth to include academic endeavors. The Information Revolution has provided almost anyone the ability to share what they know and are are able to do. Some of the YouTube videos being watched by 10-year olds have been created by other 10-year olds, sharing what they know and are able to do. An academic fair project posted on the web has potential to generate interest and extend learning beyond what an individual child learns from a 20th Century academic fair project. As educators we can support, guide, monitor and inform this kind of activity by our students. Tours in Second Life began at the Aether Education & Travel sim on Second LIfe – Jaguarland’s Bay Boat Welcome Center deck. Week 1 of the VWBPE MOOC involved touring a variety of sites and grids appropriate for education at various levels. I went to some places I had visited before and some I had never visited. Having a guide certainly helps as the highlights are quickly pointed out making self-exploration, at a later time, easier. Our tour guide, Aevalle Galicia, is an adept tour guide running tours across the metaverse, out of her location on Second Life, Jaguarland’s Bay Boat Welcome Center deck. Tour participants could not resist getting on stage and performing at Caledon’s Gaity Theatre. Gulliver is all tied down and visitors can join the villagers in climbing on top of him at this InWorldz sim. Tour 2 of the MOOC required registering on another Grid, Inworldz. Due to time zone issues I had to make the trip alone but the avis at the Inworldz entry point were friendly and helpful. Someone gave me the address of the Gulliver’s Travel Sim, as well as some spots where I could “de-ruth”. The Gulliver’s Travel sim is a great spot for anyone reading the work. JoKaydia offers immediate help for newcomers into the Grid. Tour 3 was again on another grid, Jokaydia. This is a nicely planned Grid and though I had to visit alone due to timezone and physical world requirements, the guide left notecards with landmarks. Synchronous time is great, but when schedules make it impossible it is nice to have strategies to catch people up. Playing with a pile of gold in an old Roman Building. On Thursday tour embers traveled in time in SL to visit Ancient History sites. ROMA’s multiple sims, a very large build with interactive locations. A 30 minute visit is not sufficient to see it all. The historic visit continued to the Acropolis sim. Here there is typical Greek architecture and the Parthenon up on a hill, overlooking the village. A note-card provided upon arrival gives the history of the ruins and describes the current state and efforts to preserve. This sim give both a historic and modern perspective. The sims are both rated mature so visits to these sims have restrictions. The concepts however, are worth recreating in other locations and they are examples of using the environment for the teaching of history. Trying to keep up with my in-world friends in my flying machine on Caledon. 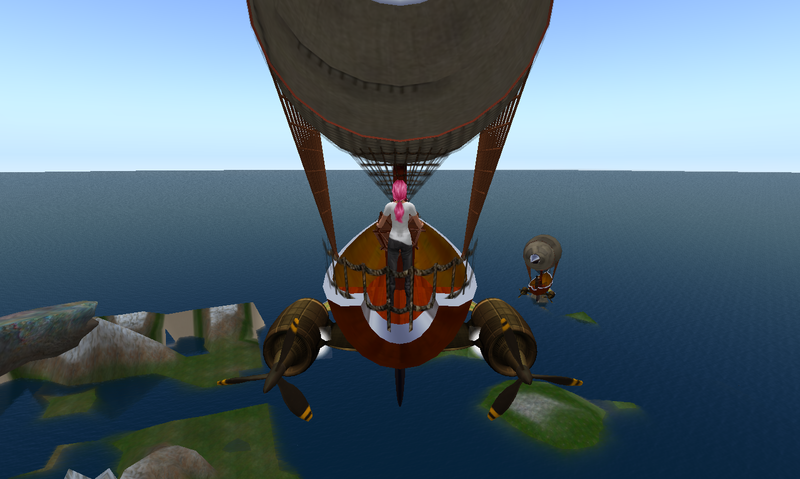 Fun Friday tour “play date” was to the Iron Cloud high above Caledon Middlesea, and fun it was! Tour participants had a great time with flying machines. This is a potential machinma location, once you learn to control your ship. Avatar flying is not allowed so you have no choice but to use a ship. The activity lends itself well to map-reading as you have to use the map and know directions to keep up with others as you zoom around the sims. Dressed in Mayan attire at a temple at the welcome area of Mayan Island in Second Life. Although I missed the Maya Island Tour on Saturday, I went back on my own, got my Mayan outfit for free, and looked around at this amazing build. The Mayans won multiple awards at the VWBPE Conference, including best poster and educational machinima. It includes quests and challenges for visitors that inform about this culture. The University of Washington’s Certificate in Virtual Worlds Class of 2011 built the Mayan Island experience. 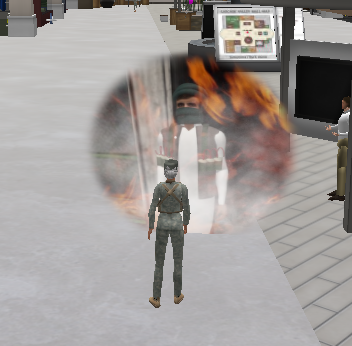 The PTSD sim has participants walk through a mall as “visions” pop up at certain times explaining how and why a trip to a mall can be difficult for individuals suffering from PTSD. The last tour of this MOOC week was to the T2 PTSD Experience to see the tiered simulation as well as visit the area of the upcoming May stream of the Federal Consortium of Virtual Worlds. Although I had read about this use of Virtual Environments, it was enlightening to actually participate. This was a serious sim to visit and demonstrated that use of the environment. The visit required several uniform changes and included an anxiety HUD. The sim builders do recommend physical word counseling from a professional to those suffering from PTSD, but the sim is a potential supplement of that counseling as well as providing an understanding of the issue, for family and friends. The MOOC Tour provided a variety and offered additional landmarks for those wishing to investigate more. You can view additional pictures on the MOOC Tour Flkr, or better yet visit on your own. The VWBPE MOOC site on P2P has more reflections, ideas, and links for more educational sites.